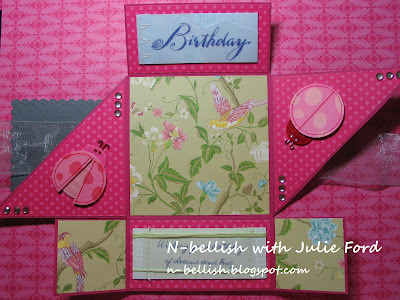 A quick post today as I finally got the photos taken of the other baby cards I made using the Stocking Punch. Remember this punch is not being continued in the new catalogue which comes out in September so if you want one to call your own you only have until the 31st of March. The Stocking Punch is currently available in the Summer Mini Catalogue which ends on March 31st, so just a week away. It co-ordinates with the Stitched Stocking stamp set. To get yours before it's to late simply send me an email to place your order. It's my sister's 40th Birthday this month and I wanted to make her a card that was extra special and different to any I'd made before. One click and I had my card idea. My email link to a tutorial arrived introducing me to a card called a 6 fold card. I read through the instructions and figured it shouldn't be too hard - hahaha. I began with a 12x12 sheet of texture Melon Mambo cardstock which I then cut down to 12x8". Popping it on the long side I scored in at 4" and 8" before turning it and scoring at 2" and 4". You then have to cut away some of the panels and fold it to make sure it all closes properly. 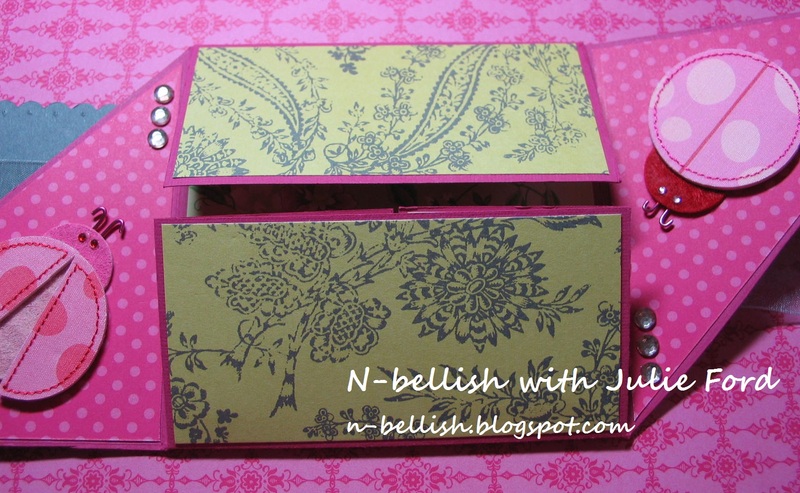 The spotted papers are also Melon Mambo and are from the Brights collection dsp pack. The other papers are a Dovecraft range called Laura Ashley and perfect for my sister. All the embellishments were bits and pieces I already had. The front of the card had to have something which goes on the top to create the featured point. I used Basic Grey cardstock and the scallop square die in my Big Shot to create this and then using the SU punches, punched out two pieces which I layered on top of the scallop. 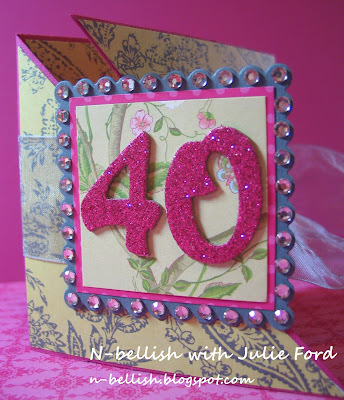 The 40 numbers are chipboard I cut out with my Big Shot and then used the heat and stick powder to add glitter to. I love the colour which was actually silver but I coloured using Melon Mambo Reinker (just pop some glitter into a bowl and add a few drops of the Reinker of our choice, stir and leave to dry fully before using). To add the finished square I had to use Sticky Strip as the normal snail or standard double sided tape just aren't strong enough to hold it. The rhinestones just added the last dimension of bling I was after, but I did have to use a couple mini glue dots to hold some of them on as they kept falling off. This card is definitely one that has taken me the longest to make so far, but I am so happy with the end result as was my sister when she received it! Welcome to the world Baby Piper. Perhaps it's being a part of the defence community that makes me talk to anyone and everyone! But in early January this year I was out to collect the mail from the letter box when I noticed a couple walking their dog down the street. Having just had Oliver I was thrilled to notice that this lady was pregnant and looked due shortly! We ended up having a short conversation and off we all went. A few weeks later we meet again at a yearly meet and greet that's organized in our area to welcome new defence families and introduce them to us 'oldies'. Here I meet Tracee again and still no bub. But bub was due within a few days. Alas this bub didn't want to make a rush and held in longer than she was due to, but on the 19th February, the very beautiful Piper joined the world. I wanted to visit but knew I'd need a card before I could go. 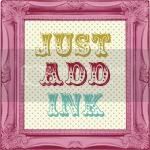 At around the same time we got notified by our head office that the Stampin Up stocking punch is not going to be carried over into the next catalogue which surprised me a lot. Knowing this I decided that I needed to use this punch to make the card. The card is farily simple to put together. 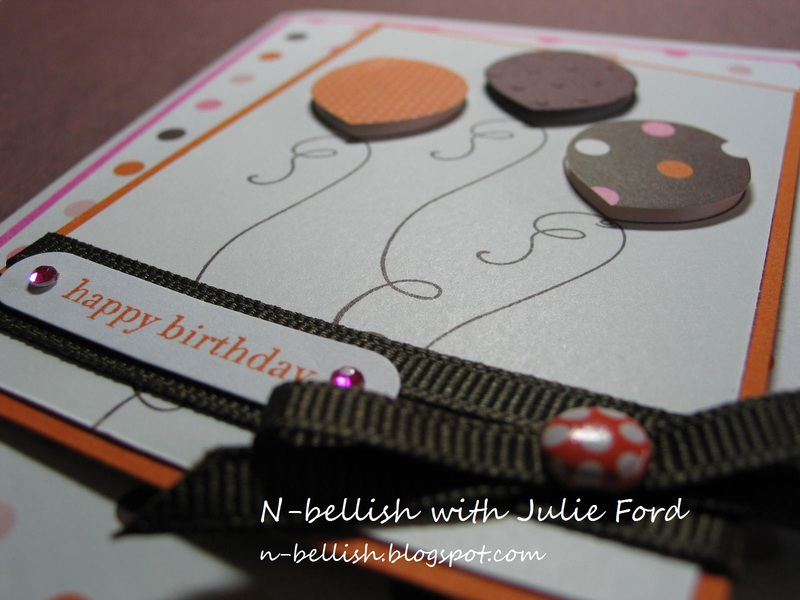 It is just cardstock layered together with some dsp. It is made from a retired cardstock called Passion Pink, but would work well in Melon Mambo. As I'm still working my way through all my bits and pieces of retired dsp this one is from a set called Love Me. 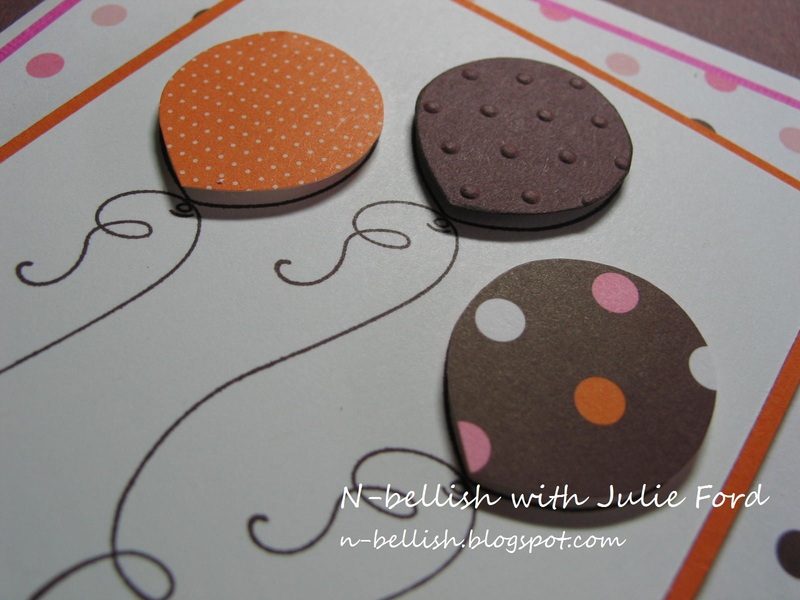 The little booties are made using the stocking punch - punched out on Whisper White cardstock, then run through the Big Shot machine in the polka dot embossing folder. I sponged a little more Passion Pink on to the stockings to add a little more colour and dimension. The other stocking parts are also stamped in the same ink and then punched out. To make the bootie the right size I did cut down the stocking a little before adding the top part. The sentiment is also from a reitred hostess set but looked so cute. Most of us stampers have lots of sentiments stored away so any would work. I loved the 'it's a girl' ribbon and it worked really well here too. I was so happy with it I did make another 8 similar cards which I will try and upload this weekend. The Stocking Punch is currently available in the Summer Mini Catalogue which ends on the 31st March so you don't have long to grab one if you're keen. If you'd like to get one just send me an email and we can make sure you don't miss out. Don't forget that it does match up with the Stitched Stocking stamp set which is also retiring at the end of this month. Happiest birthday wishes because - it's your birthday! Another birthday card today using the happiest birthday wishes set. 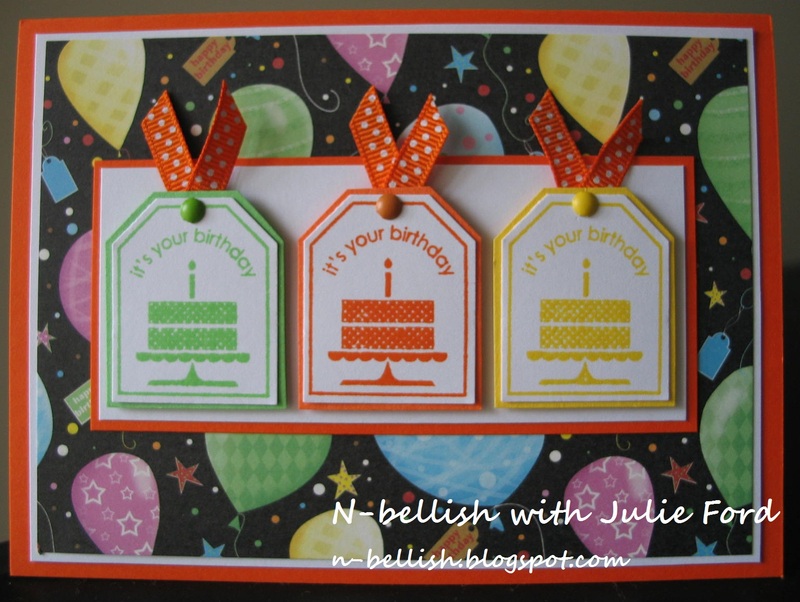 This is a hostess set of 11 stamps which are all birthday sentiments. I haven't used many of these stamps and am challenging myself to make a set of cards using each stamp set I have over the next few months. It'll help me sort out which sets I really don't need to hang on to as I'm starting to run out of storage space! This card also happens to fit with challenge #84 over at The Paper Players, which ic a sketch from LeAnne. I turned the sketch on it's side because the paper I had only worked this way. The stamped images were stamped in Yoyo Yellow, Only Orange and Gable Green which are all retired colours but fit so well with the papers. They'd easily be substituted with Daffodil Delight, Pumpkin Pie and Lucky Limeade though. The card base is also Only Orange and the matt is Whisper White. The stamped images were punched out using the small tag punch and then coordinating cardstock was punched out using the large tag punch. As I accidental cut the orange and white cardstock pieces a little short for the tags I did have to slightly cut down the sides of the cardstock tags to make them fit next to each other. Easily done though. The sentiments I stuck on using dimensionals as when I attached the ribbons and brads on they were raised on the back so couldn't sit flat. A bright cheery card for a bubbly happy person! Tools & Embellishments: Paper cutter, bone folder, snail adhesive, dimensionals, paper snips, small amd large tag punches, ribbon, brads. Crazy for cupcakes (IB&C p ) is still one of my favorite stamp sets due to it's variety of stamps in one set. 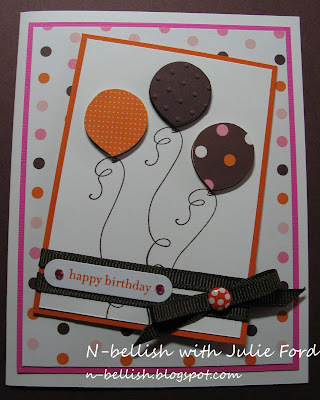 I tend to make quite a few cards using the single cupcake so decided to make one using just the balloons. This card also fits perfectly into two birthday challenges, one over at SUO and the other at Card Makin Mamas. I mentioned before about the large stack of retired designer series papers I have but with the cards I am making I am slowly making my way through them. The paper used in this card is called sweet always and I just loved the colours in it. The cardstock colours are Pixie Pink which is also retired and then current colours Pumpkin Pie, Chocolate Chip and Whisper White. 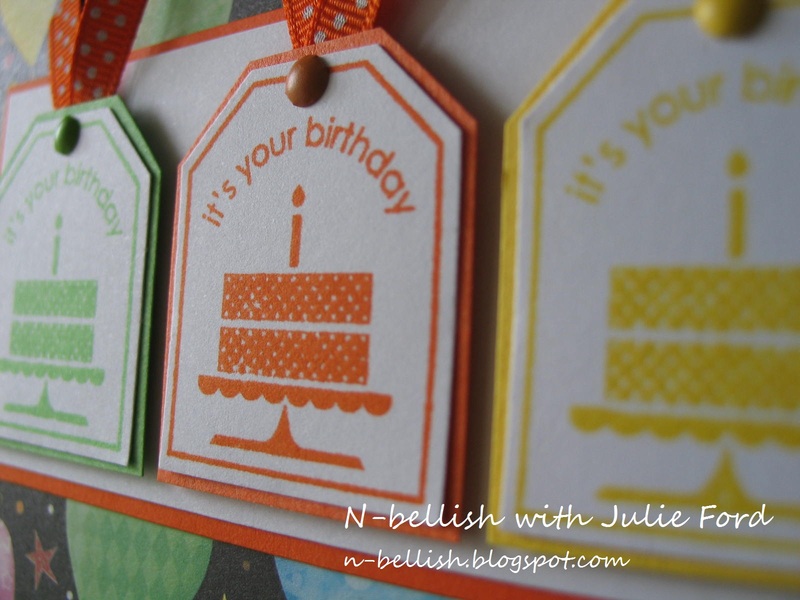 The balloons are stamped firstly onto the Whipser White cardstock which enables me to have the strings where I want them. The balloons I then stamped onto the dsp and a piece of Chocolate Chip cardstock which I ran through my Big Shot machine using the Polka dot embossing folder. Each was then cut out before being stuck on using the dimensionals. To put it all together I simply cut the cardstock and paper and then layered them on top of each other. I'm normally a fairly traditional person when it comes to layering so putting the balloon part slightly off centre was a little hard for me! But I am really happy with how much it changed the whole card. The ribbon is Chocolate Chip grosgrain and it's two pieces cu and stuck around the balloon section. The bow is made using the no tie technique and held together using a brad which I used my Signo Gel pen to draw on. I also used the rhinestone brads which thanks to YouTube I learnt how to change the colour of. They're coloured with a Pixie Pink marker and then I sprayed clear sealer onto them. They do take a little while to dry but it's easier than having hundreds of different coloured rhinestones. 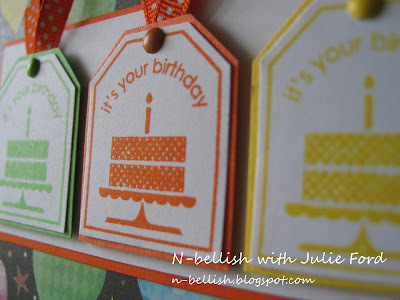 Happy birthday is from the Teeny Tiny Sentiments, stamped in Pumpkin Pie ink and cut out using the Word window punch. Stuck on using the snail. I'm really happy with how the card turned out and hope that the person I'm sending it to likes it as much as I do! Tools & Embellishments: Paper cutter, bone folder, snail adhesive, dimensionals, paper snips, word window punch, Signo Gel pen, ribbon, rhinestones.